Halfway through the first stage at a recent USPSA match, my pistol decided it didn't want to shoot anymore. So while my friends had an enjoyable time, I spent my day serving in the dual roles of range officer and scorekeeper. There's a lesson here: Always bring a spare gun. Accordingly I set about finding a spare gun, and after perusing various websites, catalogs and asking the opinions of my fellow shooters, I settled on a Springfield 1911-A1 Loaded Black Stainless Target pistol. Springfield is a major supporter of the action pistol sports (USPSA/IPSC, IDPA, Bianchi Cup, etc.) and sponsors a number of professional shooters including Rob Leatham, so if anybody knows competition guns, it's them. The Loaded Black Stainless Target is a good-looking gun, with a contrasting bright and black stainless finish that sets it apart from your run of the mill pistol and also serves a practical purpose. The dull black finish on the top of the slide virtually eliminates glare when sighting, even in bright daylight. The slide also has front and rear grasping grooves. The rear sight is a fully adjustable assembly with tritium inserts, and it's mated to a blade front similarly equipped. The ejection port is lowered and flared for sure ejection of spent cases, and a fully supported, match-grade barrel and full-length, two-piece recoil spring guide rod ensure reliability and consistent lock-up, which is essential for accuracy. The Loaded Black Stainless comes standard with a mag-well funnel, an indispensable feature on a gun meant for action pistol events. The gun features extended, ambidextrous safety levers and a beavertail grip safety with palm swell. Metal has been relieved under the trigger guard for a high grip, while the aggressively textured G-10 composite grips and checkered mainspring housing combine to ensure a firm, nonslip purchase. The lightweight, aluminum trigger--which is adjustable for overtravel--has a very nice, crisp pull that, according to my scale, breaks at slightly less than four pounds. To smooth out reloads, a modest mag well funnel graces the bottom of the grip frame. I feel this is one of the most practical devices you can add to any 1911 pistol, and I am glad to see more manufacturers offering it as a standard accessory. I gathered up a selection of factory and handloaded .45 ammo and beat feet to the gun club to see if it performed as good as it looked. I rested the Springfield and sent .45 bullets downrange at 25-yard targets. The Loaded Black Stainless has extended ambi safety levers, and metal is relieved under the trigger guard to permit a high grip. Scarlata was really impressed with the G-10 composite grips, which made for a secure hold on the pistol even with sweaty hands. The fully adjustable rear sight incorporates tritium dots, as does the front, but the author wishes it had a plain black rear and fiber-optic front. After a few turns of the rear sight's elevation and windage adjustment screws, the Springfield produced very consistent groups running from two to three inches in size. 1911 aficionados will be glad to know it consistently printed the tightest groups with 230-grain loads. I then belted on my competition holster and mag pouches and proceeded to run the 1911-A1 through a series of offhand drills on a pair of combat targets from ranges of seven, 10 and 15 yards. Using both supported and unsupported (one-handed) firing stances, I proceeded to perforate targets. It was during the drills that the G-10 grips really came into their own. 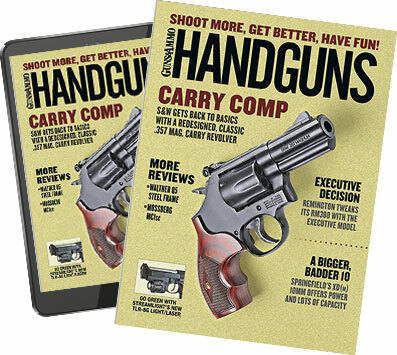 Despite my hands being sweaty (hey, it was August in North Carolina), the pistol did not move around in my hands at all, and the grips provided excellent recoil control and allowed me to make fast, accurate follow-up shots. In fact, I think you would have had to tear the skin off the palms of my hand before you could pull this pistol out of my grasp. Both the modest mag well funnel and the scalloping on the grip behind the mag release button made for fast reloads. The sights provided a clear, sharp sight picture for fast target acquisition and transitioning, although to be quite honest I don't see the need for night sights on a pistol that is intended for target shooting. If I had my druthers, it would sport a plain black rear sight and fiber-optic front. But then no one asked me. All in all, I found the Loaded Black Stainless Target a very shootable pistol. In fact, while I purchased it as a "spare" gun I have a feeling it may become my primary gun when I'm competing in USPSA Single Stack. If you're looking for a pistol for action-pistol competition, military/police service or home defense, this Springfield is ready to run.